Ludhiana: Under the theme ‘Universal Health Coverage: Everyone, Everywhere,’ the Department of Food and Nutrition, College of Community Science, Punjab Agricultural University (PAU), celebrated World Health Day in association with the members of Indian Dietetics Association (IDA), Punjab Chapter. 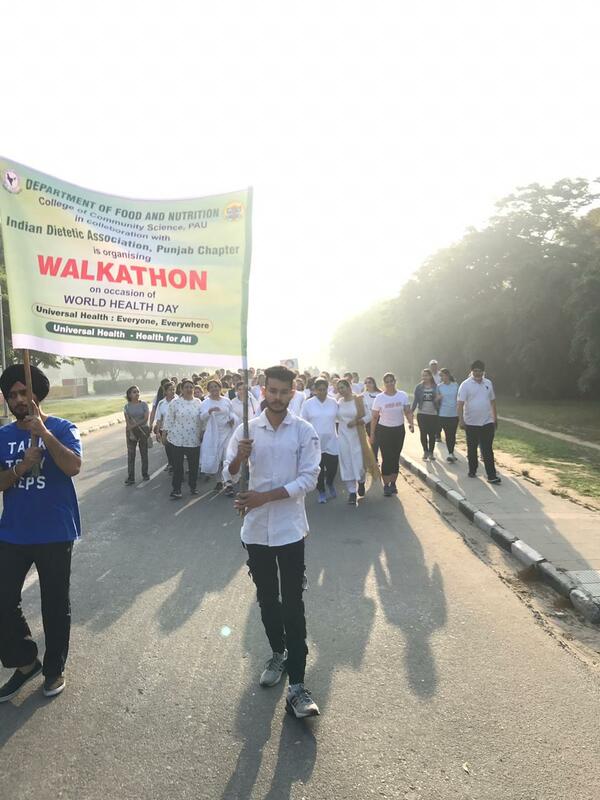 Walkathon was organized at PAU in the morning by the students and faculty members of the University, members of IDA Punjab Chapter and dietitians from city hospitals of CMC and DMC&H. This was followed by a yoga and meditation session by Art of Living, Ludhiana. The three aspects of health i.e. physical, social and mental were highlighted. Dr Kiran Bains, Head, Department of Food and Nutrition, PAU, said health is not a one day process and one has to invest time on everyday basis to avoid diseases in later stages of life. Dr Jaspreet Kaur, President, IDA Punjab Chapter, highlighted the importance of practicing yoga and meditation daily to manage stress. She discussed how to focus on overall health and wellbeing. On the occasion, Nukkad Natak on “Importance of Iron” and nutrition related fun games were conducted by the undergraduate and postgraduate students under the guidance of Dr Sonika Sharma, Assitant Professor, Department of Food and Nutrition. Exciting games such as nutricharades, food crossword, sipper- dripper, choose the food and nutri darts were organized to create awareness regarding nutrition in a playful manner. Dr Sandeep Bains, Dean, College of Community Science, PAU, appreciated the efforts of the faculty and students of the Department of Food and Nutrition in organizing the event.